Print house: Amazon Digital Services, Inc.
Have you ever wondered what a poker champion is thinking when he is facing a huge bet that puts his tournament life at risk? 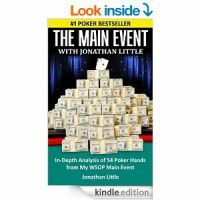 Jonathan Little, a two-time World Poker Tour Champion with over $6,000,000 in career tournament winnings opens up his playbook for everyone to see. He will not only show you how he cashed in the 2014 World Series of Poker Main Event for $22,678, but he will also teach you why he made every crucial move in 54 detailed hands. This book is set up in a quiz format, forcing you to reevaluate your default poker strategy and alter it drastically based on your opponents’ tendencies. By questioning your decisions, you will be able to progress as a poker player and increase your profits at the table.